Who doesn't want a house which is the talk of the town and the heart of the neighbourhood's social life? We all like to entertain from time to time, but if may often feel like a week's work just to get your home ready for a party. What if, however, you had a home that's always ready for a party, a house full of colour, energy, and incredibly social spaces? Today we will look at a house that is exactly this, and will make you green with envy. 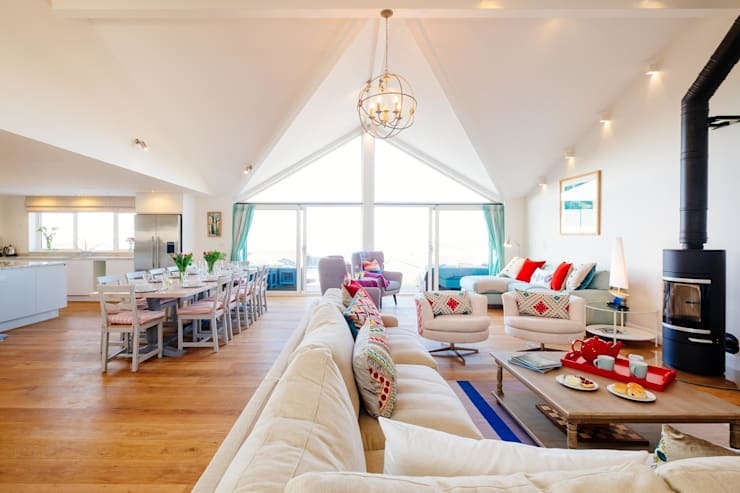 This self-catering holiday home in Cornwall was built to specification with elevation views of the sea. If you join us on a tour of this inspiring home, you are sure to see the inherent beauty of it just as we have. Now, come along and see for yourself what a wonderful holiday home can look like! Here we have our first look at what this holiday home has to offer. The generous interior space of this house stretches across an open plan kitchen, dining and living area. This allows for a communication between spaces and a flow of energy to make the house extremely sociable. At the back of the image, we can see a window which fills the entire gable area, allowing magnificent views of the sea, and easy access onto the balcony of the home. This feature also bathes the entire living area in rich, natural light, making the atmosphere even more convivial. We can easily see ourselves relaxing on one of these plush sofas around the wood-burning fireplace or hosting lavish dinner parties at the extensive dining table. Next up, we move over to the kitchen area, of which we have nothing less than very high expectations. To our delight, there is no disappointment here. 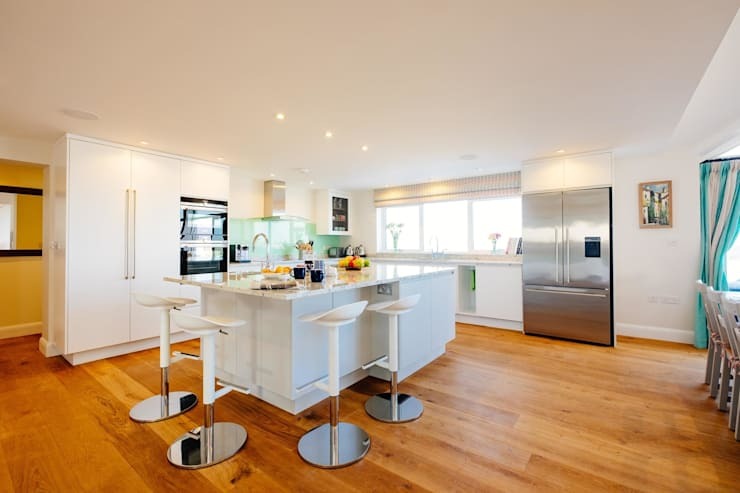 This spacious kitchen is large enough to accommodate for all guests and many a party, with extensive worktop space and all the necessary appliances. The wooden flooring in the room is well balanced by the light colour of the cabinetry, walls and furniture, making the space feel more open and inviting. We can see that this project aimed to create a very social atmosphere, and that result had certainly been achieved. The architects had certainly outdone themselves! This luxurious holiday home can sleep up to 12 guests at a time, and all of the bedrooms are equipped with zip and link beds which can easily be set up as twin beds or kings size options to suit the needs of the vacationing group. This flexibility and capacity for a large number of people is fantastic, but obviously requires sufficient ablution space to accommodate for all of the guests. Fortunately, that is not an area where this project falls short, as it has more than enough bathroom space, and luxury bathrooms at that. 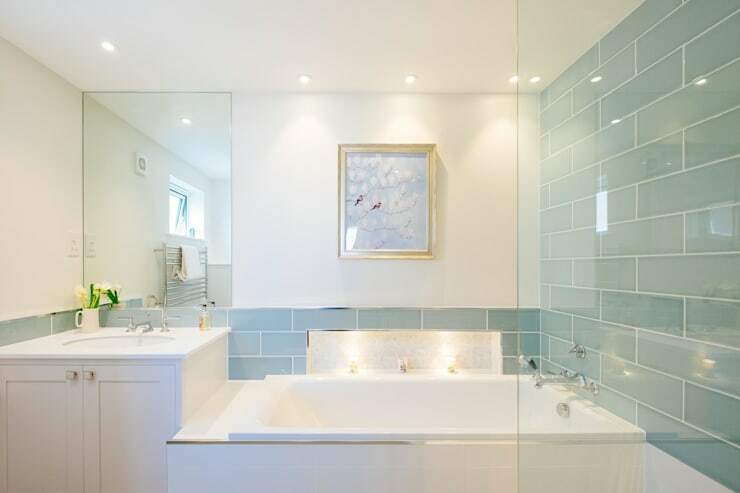 Here we have one of the main bathrooms, which is an en suite to a master bedroom. The muted blue used in conjunction with white gives a beautifully subdued and serene atmosphere which is so welcome in a bathroom space. We just wanted to take a minute a look into another special feature of this holiday home. The house is situated in North Cornwall, just 5 minutes' walk from the Polzeath beach, a popular surfing destination. Well in-tune with the most likely recreational activities of guests, the architects included a change room for inhabitants to use when coming back in from the beach. This space may be very practical, but it is also very lovely, decorated in blue mosaics and large brown stone tiles. Lastly, we move around to the back of the home, and take a look at what the space is like outside. Here we can see a spacious lawn, and you can just imagine the lazy Sunday afternoons spent on enjoying a picnic in this backyard. 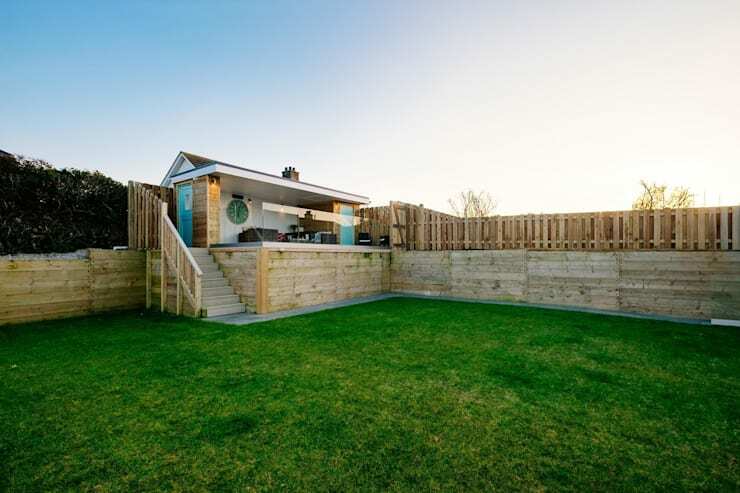 At the back, there is also a compact pool house, which includes an extensive deck to keep the party going outdoors. We definitely haven't seen a home so conducive to a great party in quite a while. What are your thoughts on this holiday home?